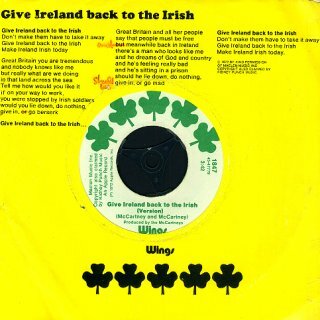 Give Ireland Back To The Irish b/w "Version"
Detail : Paul's third solo single. 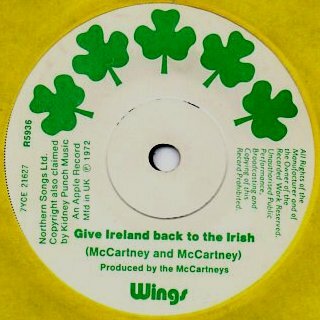 Credited to "Wings" - the debut single. 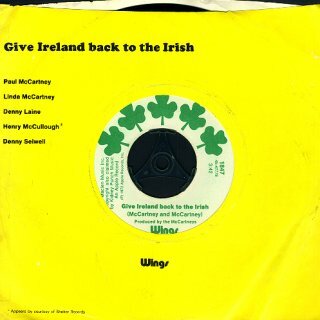 Now "Wings Mk.II", this incarnation featured : Paul, Linda, Denny Laine, Denny Seiwell and new member, Henry McCullough. on January 3rd 1972 (John added his voice of protest with "Sunday Bloody Sunday"). It was Paul's first and only "political" song, but not the last to be banned by the B.B.C. ! As far as I can work out, this was the first hit single to have as it's B-side, an instrumental version of the A-side. Of course, with the advent of disco, and the 12" single this became the norm. 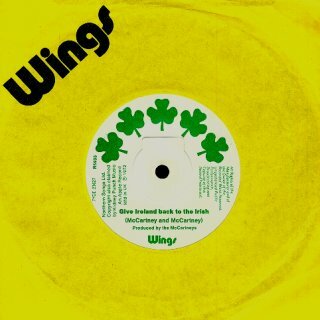 The label was a white background with five shamrocks, and the cover was bright yellow with "Wings" printed on it. I also show the U.S. single version on Apple 1847. I bought this on import as it has a better sleeve, containing the group information and the lyrics.